Since the 29th January, 1942, Desert Island Disc has been a regular radio programme, and one that I always loved listening to, and finding out more about the guests they would have. As much as I enjoyed listening to Desert Island Disc, I felt it was missing an element of personability in having guests from all walks of life. I came across Share Radio earlier this year, and loved their approach of the ideology of Desert Island Disc, but with a digital twist. When Share Radio reached out to me to be a guest on their show I was so excited, and then soon realised that I had to do a lot of thinking, reminiscing and listening to music. Share Radio launched in November of 2014 and offer financial advice covering everything from budgeting, markets, investments, small business finances and so much more. They focus heavily on movers and shakers in the business world and offer a great mix of songs, and practical business advice. What made me a great potential guest on their “track record” show was the combination of both being a digital influencer and as you might know; a former hip-hop dancer. The two combined meant that I could not only share some great knowledge with their viewers, but also some old skool tracks that I used to dance to back in the day. Hip-Hop, R&B and Soul music was a huge part of my life growing up and it is something I always incorporate into my keynote seminars. I even went as far as using some of my favourite songs as hashtags in the first edition of my marketing book of the year nominated book; Think #Digital First. I had to think long and hard about the songs I wanted to share on this radio show, and also the reasons WHY. The songs I decided to share with Sue Dougan on Share Radio are ones that I have great memories attached to and gives people an insight into my life growing up, and how I have got to where I am today. 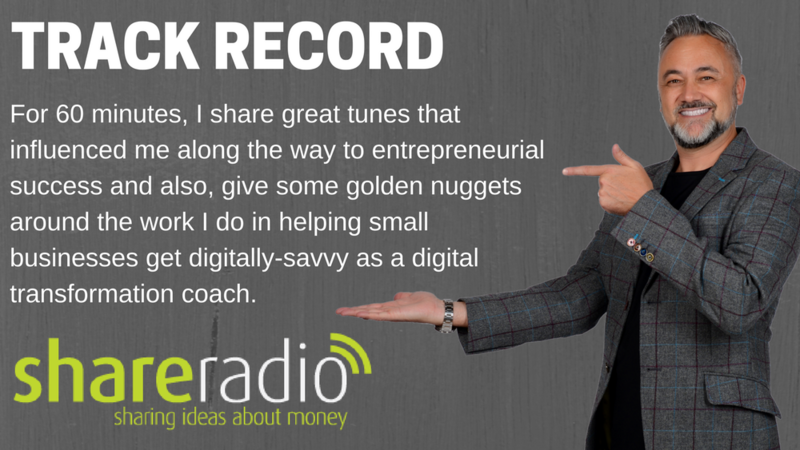 For 60 minutes, I share various great tunes that influenced me along the way to entrepreneurial success and also, give some golden nuggets around the work I do in helping small businesses get digitally-savvy as a digital transformation coach. I hope you enjoy my radio take-over on Share Radio and you can listen here.